The fight to stop the BLM from its plan to eradicate wild horses from private and public land in three herds in the Red Desert of Wyoming is personal for me. On my first trip to Adobe Town in 2004, I fell in love with a gentle, battle-scarred grey stallion and his small, beautiful family. He ran right up to me and I waited, not knowing that this encounter would change my life forever. His filly came up next to her father and it looked as though she grinned at me. I had to keep coming back to see them, learn more about their lives, and photograph them as they as they are best portrayed, wild and free, at home in the dry, dramatic and isolated landscape of the Red Desert. I wrote my first book, Wild Hoofbeats: America's Vanishing Wild Horses to let people know how magnificent these horses are, and that they deserve to live free. Over the past 10 years I have traveled to Adobe Town, Salt Wells Creek, and Great Divide Basin in all seasons of the year, even the depths of winter. One overwhelming thing stands out for me, after having driven thousands of miles on unmarked dirt roads in these Herd Management Areas – these horses are uniquely suited to this harsh and forbidding landscape and they belong there. They belong there more than the invasive and destructive cattle and sheep, and more than the land wrecking oil and gas drilling. I am a plaintiff on a lawsuit to stop the BLM from removing over 800 wild horses from Adobe Town, Salt Wells Creek, and Great Divide Basin. The roundups are scheduled to start in two weeks. Without any care for Environmental Analysis, land use planning, or NEPA, the BLM announced its plans to proceed with these roundups and gave the public no opportunity to comment on their plans. Of course, the BLM ignores public comments anyway, but we were not even allowed to make our voices heard. The roundup was announced only 1 month before the start date, barely time to get a lawsuit in place, but we did, and the violations of the law and procedure are so glaring that I believe we have a very good chance of winning and stopping the BLM in its tracks. Public Land in the Red Desert belongs to the public, that means all of us, not just the Rock Springs Grazing Association. The BLM must not be allowed to get away with pandering to one special interest group. But I began with telling you that this is personal. These horses aren't simply numbers or dots on a map to me. I know these horses, having observed many of them for many years. I have seen their foals born, their stallions age and lose their mares. I have seen the young stallions win new families, and have seen foals playing at dawn. 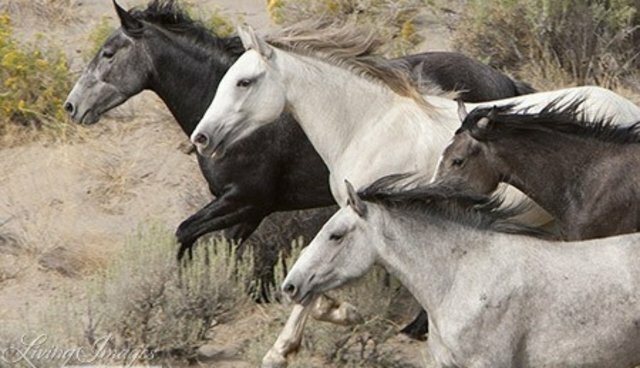 These wild horses are living, breathing beings, and they deserve to live their lives in freedom, at home in the spectacular Red Desert. We deserve to have them on our public lands, enriching the landscape and our lives. 1. Go to the BLM Wild Horse and Burro Advisory Board Meeting on Monday August 25, 8-5:30 pm in Riverton, Wyoming and make your voice heard in the public comment session. We want to fill the meeting with wild horse supporters. If you cannot attend, send in your comments. You can find the information here. National Wild Horse and Burro Program, WO-260, ATTN: Ramona DeLorme, 1340 Financial Boulevard, Reno, Nevada, 89502-7147. Comments may also be e-mailed to the BLM (wildhorse@blm.gov). Please include "Advisory Board Comment" in the subject line of the e-mail." There will be a protest and press conference at the meeting, check back at Wild Hoof Beats and The Cloud Foundation for more information as it becomes available. Rock Springs Wild Horse and Burro Specialist Jay D'Ewart: (307) 352-0331 Rock Springs BLM Field Manager Kimberlee Foster: (307) 352-0256 BLM High Desert District Manager Mark Storzer: (307) 352-0256 BLM Wyoming Director Don Simpson: 307-775-6256 BLM Director Neil Kornze: (202) 208-3100 Secretary of the Interior Sally Jewell: (202) 208-3100 3. The last thing you can do to help is to donate to the Cloud Foundation legal fund for this lawsuit which you can do here.